DIRECTIONS -It will be at the Elm Ridge Overlook Shelter at the Winton Woods Park. 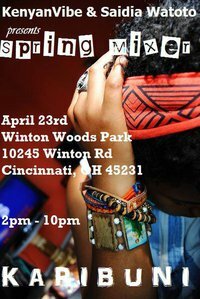 The address above is to the main entrance of Winton Woods Park. If you are coming north on Winton Rd, Make a left on Valleyview Drive. If you are coming south, make a right on Valleyview dr.
On Valleyview drive, you will see picnic shelters to the left and right, Elm Ridge Overlook will be about 1/4 mile on your left. PLEASE NOTE: Park requires a daily parking permit for everyone. It is $3. FOOD - Grilled Meats(Nyama Choma),and other side dishes. For the great cooks out there, you may carry your dishes as well. DRINKS - Soft drinks and alcohol(while supplies last) provided .Alcohol permitted. Carry your choice drink. MUST BE OVER 21YRS TO DRINK. FRIENDS -From within Cincinnati to outside Ohio, Your friends, Our friends, Everyone's welcome!